I am an avid reader, not only of fiction but all sorts of non-fiction too. Self-help books are a special interest of mine as well: how-to and do-it-yourself books/magazines on home improvement, painting, gardening, organizing, decluttering, time management, self-care, self-discovery, and healthful eating. 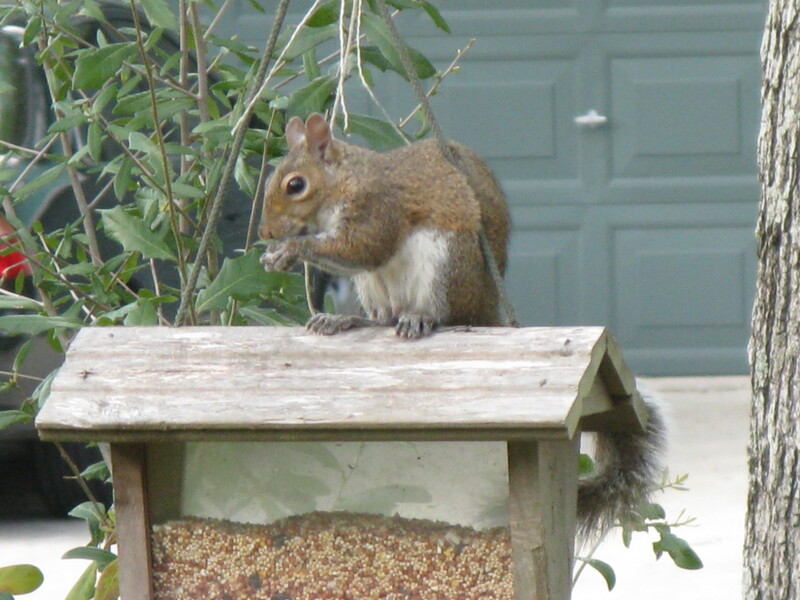 Like this squirrel finally figuring out how to grab some bird seed from this hanging bird feeder, I’ve tried many ways of doing things to find out what works best for myself and my family. I am forever seeking ways to improve our lives as normal changes occur over time, so I love learning about new ideas, and solutions. Take a lesson from the squirrels, never give up! Or a bit more challenging like managing your time and figuring out if you’re a calendar person or day planner or an app person? I’m definitely a calendar person. I am a tactile person; I like the feel of a pen in my hand, stickers to peel and stick for reminders or after I’ve accomplished something that day. Makes for a pretty colorful wall-hanging at the end of the month! One of the most useful tools I’ve discovered over the years is a timer. A timer works wonders for me on those days that I feel scattered or overwhelmed by all I have to do. I set the timer for 15 minutes so I can focus on one task at a time. I must say, it helps tremendously and I have found that many tasks (like unloading the dishwasher or loading it) take only 5-15 minutes. Second terrific use for a timer? A timer works great for children doing homework. I used it with my son when he was overwhelmed with the amount of homework he needed to do in elementary, middle and high school. He’d almost have a panic attack thinking about everything he had to get done; so much so, that he couldn’t decide which assignment to tackle first. I would have him start with the most important or urgent assignment. He’d set his timer for 15 minutes (sometimes 30 minutes when he was older) and do it. At the end of that time, he could take a 5-10 minute break: go for a walk outside, get a glass of water, play a short card game with Mom. When the timer went off, he knew to set it for another stint of 15-30 minutes for homework. It really helped calm him down and allowed him to take his homework one step/assignment at a time. And, if he had a tough piece of homework, I had him do the easy stuff first. That helps reduce the pressure and the dread of doing that tough assignment/topic. And, if he was having trouble with one assignment, when the timer went off, he could switch to an easy assignment. “You can always go back to it”, I told him. I believe he even uses the timer now that he’s in college when he needs to. The third use for a timer helps with clean-up tasks with your children. Telling a child to “Go clean your room.” doesn’t help them break the task into manageable chunks. Use the timer to help you decide on the task you want them to complete. The key is to adhere to the timer. When the timer goes off – make sure they STOP! Even if there are some clothes left out. STOP. Now set the timer for fun! 5-15 minutes of dancing, hoola-hooping, running outside, getting a drink of water. When the timer goes off again, they know it’s time to finish their task or carry out another one. Once again, set the timer for the task. You *must* adhere to the timer, especially for young children. They (and you) can get into a real rhythm with no nagging involved. The timer tells them when to start and when to stop. They (and you) know exactly what they’re supposed to do and the timer helps them focus. Have you tried using a timer? Has it helped you, your children? Or do you have another tool you use to help you or your children focus? I’d love to hear about them! Copyright 2011, 2012, 2013 – All rights reserved. Yup, Two Surgeries Within One Year. You? Our son has never had an injury growing up. Yup, mom was protective. I’m not going to lie and I’m not going to apologize. And yes, he’s our only child (everyone always asks that). I guess if you have more than one child, you get numb or nonplussed about injuries because you have more of them to deal with – that’s my guess, anyway. Our son had two major (to me) surgeries this past year while away at college. Thank heavens my husband is the calm one and handles life’s unexpected mishaps better than I do. That’s why I love him. I can freak out and cry and he can calm me. It’s a perfect match. While working at a sports and game bar last summer, my son tried out their stupid punching bag to-measure-your-strength “game”. His last hit he decided to go all out and really punch the thing. Unfortunately, he hit the bag where the padding was worn thin and so, hit the thick iron piece that held the punching bag in place. He was in excruciating pain but finished his shift as a server. He grimaced as a co-worker shook his hand and he could barely drive home at 2:00am. We thought his wrist had just been jammed since there was no bruising, he could move his fingers and even push down with his fingers. We iced it, gave him something for the pain and within a few days, it was no longer swollen and the pain had abated. We honestly didn’t think he broke it. A few weeks later, he started his Fall semester in college and he asked his sports professor for any exercises to help him stretch out part of his wrist that seemed stubborn. Surgery went well although it took seven (yes, 7!!) weeks between a doctor’s and specialist’s appointments, having an MRI, reading it, and keeping a brace on it while they awaited the results and to schedule the surgery. He was then in a cast for 9 weeks and took all of his exams at the Student Center with the help of a volunteer transcriptionist since he is right-handed and he could barely hold a pen in his hand because of the cast. We worried about his mental state but he coped just fine. I told him there was a lesson in this for him to learn: how to ask for help. He loves to do things on his own, figure things out on his own, do for himself and now he *had* to ask for help. He had no choice. He grudgingly agreed. We were glad when his cast came off right before he came home for Christmas. 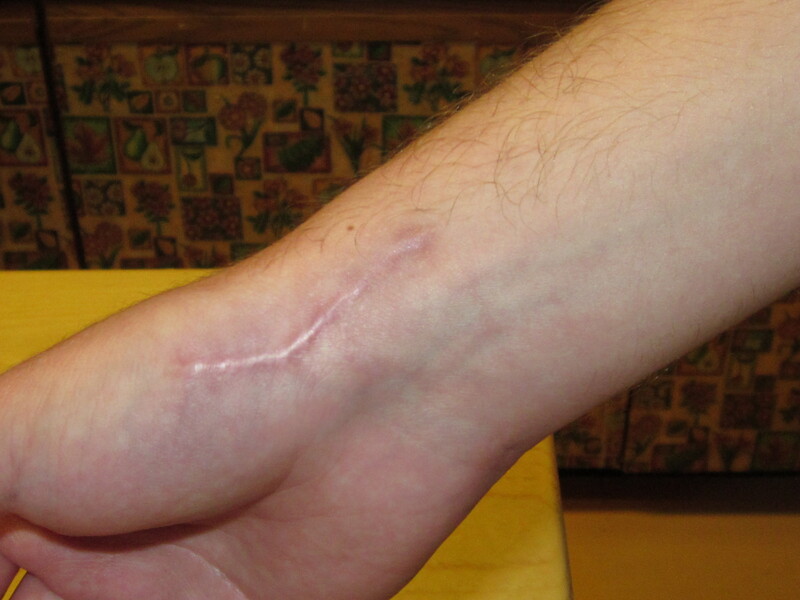 He now has a permanent screw in his wrist. My baby’s elbow!! If you look at the top of his elbow, you’ll see a long patch of lighter skin. That’s where he landed. During his Spring semester, I got a call from our son asking for his insurance information. Thankfully, it is required that students have insurance while they attend college so he has insurance through the college which is all wrapped up into his and our student loans. Anyway, he didn’t have his insurance card with him…at the emergency room at the hospital. What?? My heart lurched. He had been testing out a friend’s long board to see if he liked it enough to buy his own when he went over a speed bump and was thrown forward. Strangely enough, the long board went forward too, not backward like you would think. He landed on his left elbow and…you guessed it…he broke it. And no, he was not wearing any sort of protective gear which he would have had he tried anything like that at home. I told you, I’m *that* kind of mom. Instead of seven (7) weeks worth of doctors’ visits like his wrist, the surgery was scheduled within a week and he was very happy to hear he wouldn’t have to wear a cast. He was all wrapped up, of course, and had to wear a sling for a few weeks but no hard cast. Yay! 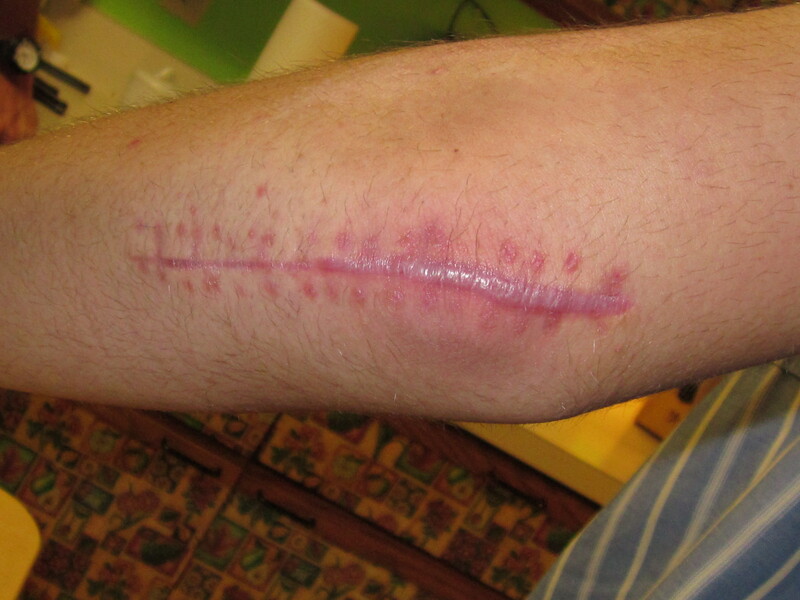 He had his last check-up here in town and now has a permanent flexible metal plate in his elbow with six (6) screws. The doctor said only 10% of patients request a second surgery to remove it; the rest simply live with it forever. My son was amused to hear he’d have to get a doctor’s note if he ever flew because he would now set off their metal detectors. 🙄 Yes, I’m rolling my eyes. We told him, “That’s it. You’re done. You didn’t have any accidents or injuries growing up, now you’ve had two. You’re all done.” He’s agreed. Pssst, we’re still loading him up with safety gear before he goes back in August with or without a long board. Parents’ prerogative. So, that’s how this past year has been for us. How about you? Any challenges, setbacks, mishaps you’ve survived? I’d like to know I’m not alone. Copyright 2012 – All rights reserved.